A good experience for a change! I haven't had positive ones with most of my wind turbine building courses. 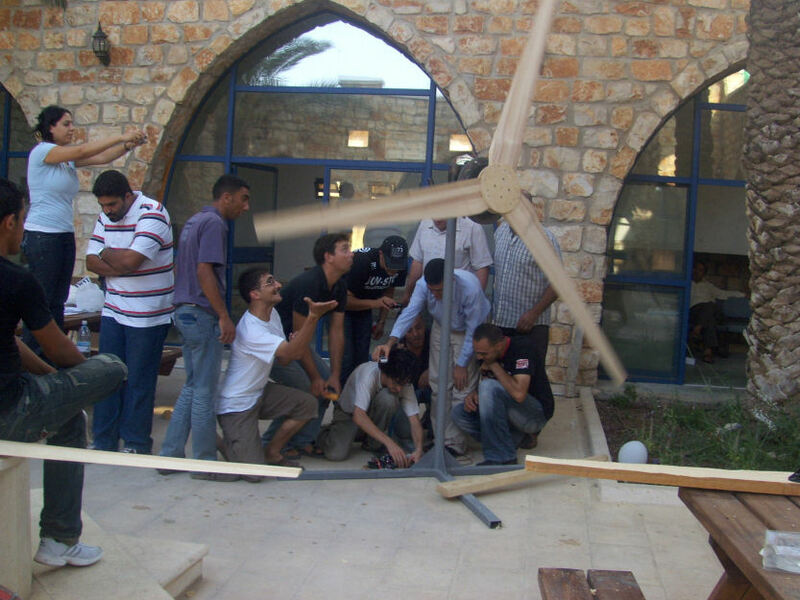 It's not that we finished a fully working wind turbine in this course – no, the usuall constraints of time that were imposed did not allow for that. But i have a feeling that this time – the two turbine who were bought as kits in various stages of completence, will be erected. Simply because – these guys really need the electricity! from the 9 palestinians taking the course, there are guys living in the most remote off grid locations in palestine. Finishing and installing these wind turbines is simply a hugh increase in quality of life, one that i hope they won't skip on. Alla allready published pictures in a local arabic online newspaper, first time i had to translate from arabic to english – apperantly there isn't a possibility for that in yahoo's altavista, so i moved to google for translation – very nice tool i may add – so here are some pictures from that site. The translation (use this link) of the complete article refers to the turbine as a fan… I'm very upset by that no need adding, i just wonder if it's google's translation fault or the articles writer? Other then that, there are a few NGO's leading the camp with small wind turbine in developing countries, one of them is BlueEnergy, which her co founder Mathias Craig was recently recognized as a Hero for the environment by CNN, and are doing a beautiful and inspiring job in south America with exactly the same kind of wind turbine technology. Location of the course – sachnin's local "Towns association for environmental quality agan beit netofa"
פורסם בקטגוריה טורבינות רוח קטנות לייצור חשמל, עם התגים DIY, wind turbins, בנייה, טורבינות רוח. אפשר להגיע לכאן עם קישור ישיר.